COLORADO SPRINGS — The Pentagon’s brand-new Space Development Agency intends to make a formal request for information from megaconstellation ventures and their vendors this summer. 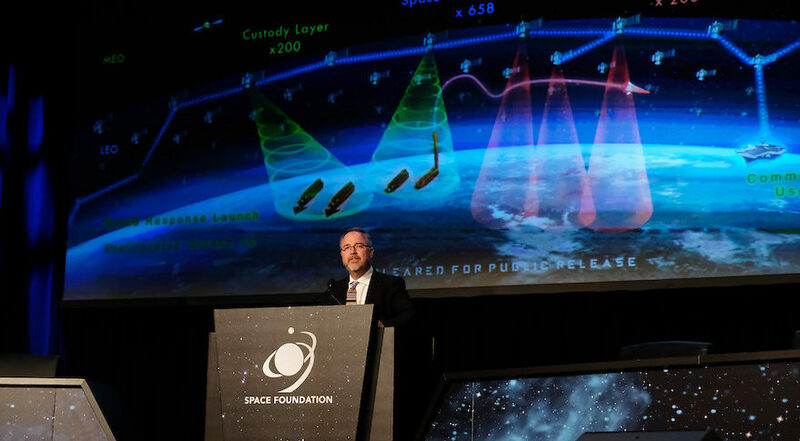 Space Development Agency Director Fred Kennedy started working with such ventures when he was running Blackjack, a Defense Advanced Research Projects Agency effort to buy small satellites from the same vendors supplying megaconstellations like OneWeb. His intent today is largely the same as it was back then: find a way for the U.S. military to leverage the industrial capacity that private capital is creating to build and launch hundreds or thousands of small satellites to low Earth orbit on an evolving mix of commercial launch vehicles. The key difference: as the head of SDA, Kennedy has been invested by the Office of the Secretary of Defense with the authorities he needs to put operational capabilities — not just tech demos — on orbit. Kennedy, a retired U.S. Air Force colonel who earned his PhD at the University of Surrey — home of smallsat pioneers Surrey Satellite — outlined a bold vision this week for using large constellations of small satellites to take over military space missions ranging from missile tracking and reconnaissance to communications and navigation. Kennedy’s singular focus between now and the Oct. 1 start of the new fiscal year is to refine a LEO-based architecture that aligns with the so-called space sensor layer of missile-tracking satellites that Undersecretary of Defense Mike Griffin — his boss and longtime colleague — sees as critical to countering China’s hypersonic missile threat. Assuming SDA gets its funding, Kennedy intends to hit the ground running come October. To do that, SDA plans to issue a request for information, or RFI, this summer, probably in July, followed by a draft solicitation by Sept. 30. “Once I do one or two spins on the architecture, and that’ll probably happen this summer, I would like to get an RFI out because I want to be able to calibrate, sanity check, what we’ve come up with against what commercial thinks is feasible,” Kennedy said. Kennedy declined to discuss the specific focus or details of the planned RFI. Kennedy said SDA is also paying close attention to the smallsat capabilities put forward by traditional contractors such as Lockheed Martin, currently building the bulk of U.S. military satellites. “We are working with all of our legacy providers as well,” he said. When a reporter noted that OneWeb founder Greg Wyler recently claimed one of his self-funded side projects has developed an antenna module that costs $15 and paves the way for user terminals priced between $200 and $300, Kennedy expressed skepticism. “Everybody else says it’s pretty expensive,” he said. “I would love to have that [cheap] phased array antenna. I’d love to be able to mount that thing on a Humvee. I’d love to have it on every dismount’s backpack.